Kids Deluxe Obi Wan Kenobi By: Rubies Costume Co. Inc for the 2015 Costume season. There is a legendary Jedi who fought in the Clone Wars and also helped one Luke Skywalker find the path to become a Jedi, that man's name is Obi-Wan Kenobi. He was trained by master Qui-Gon Jinn and would go on to train Anakin Skywalker. 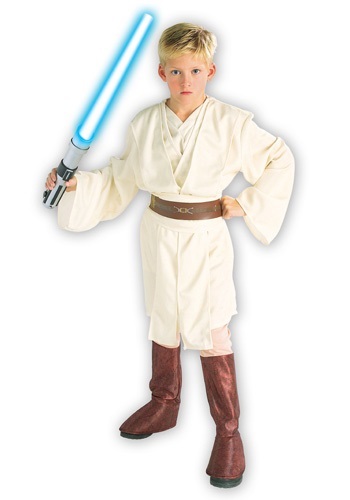 Now your little one can look just like the master Jedi himself in this Star Wars costume.